The results of not being able to do any beta tests and always being short on development time, here is the 1.52 version fixing the errors that got creeped while I added batch mode to Crap. Anybody wants batch mode for Crap? * Enforces R character as the first character of the disc id. * Now displays channel name it gets from the banner header. * You can select the naming of the output file. * Now channels are created in the Wad directory. * wad packing is done in the Temp directory. 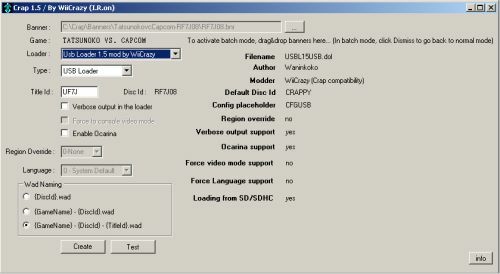 Making a few changes in the code it can be used in the custom channels… so one can take the disc based game’s banner and can build a channel for the game as it is exactly seen in the disc channel… And the resulting channel can boot the game from usb drive. I’ll instead will use it to demonstrate custom channel launching feature of Crazy Intro with a lame intro… Yeah intro is lame, I didn’t have time to make better one….